Pelling is a small hill town of western Sikkim perched at an altitude of 6,800 feet with magnificent views of Mt. Kanchenjunga. This town has a rich history, natural scenic beauty, and local culture. Pelling is a town where tourists come to get a close view of the snow-capped mountains and that is the reason why it is becoming a rich tourist destination in Sikkim. Due to its beautiful location, there are many hotels and lodges emerging in and around Pelling. To reach from Siliguri to Pelling you can get bus, train, car, flight but the easiest way is to reach by car which takes 4 hours 58 minutes with a Siliguri to Pelling distance of 132.5 kilometers to reach Pelling by car or taxi. If you are going with your family, hiring a car or taxi is the best idea. There are many service providers to offer you with the best taxi or car service but among them, Disha Tours offers you the affordable car rental in Siliguri to Pelling with all the services for you to reach safely. Different car hire services in Siliguri has different fares to meet your needs. To avail, the affordable and the most reasonable Siliguri to Pelling taxi fare contact us to make your journey a perfect one. The road of Pelling is well connected to the major towns like Siliguri, Gangtok, and Darjeeling. They have well maintained and metalled roads. Siliguri to Pelling road condition is also good but it is steep so it is a must for you to either take a taxi or a car to travel other than a bus. If you really want to experience the wonderful destinations of Pelling from NJP then get connected to Disha Tours New Jalpaiguri Junction railway station for a rental car. NJP to Pelling distance by car is only 4 h 57 min (137 km) which is not a barrier to witness this beautiful destination. Google always gives the route map distance from NJP to Pelling. For your ease, we are sharing the distance from NJP to Pelling, hence no need to go by shared car from NJP to Pelling, hire car from Disha tour and Travels at best fare. A town rich in monasteries and temples which will offer you many activities like monastery visit, rock climbing and many other things. It is also a point for trekking with the sightseeing of many waterfalls around the town of Yuksom. This monastery is an important Buddhist shrine in Pelling. Built in 1705, this monastery had beautiful architectures and gives you peace and serenity as you enter the monastery. Many paintings and sculptures can be seen on the walls of the monastery which make you know about the cultures and traditions of Buddhist. This is one of the major attractions for the tourists. You can have the chance to observe this monastery. It was constructed in 1697 and it was considered as the most crucial Buddhist shrine in the region. The wonderful view surrounded the monastery will add an extra attraction for you. 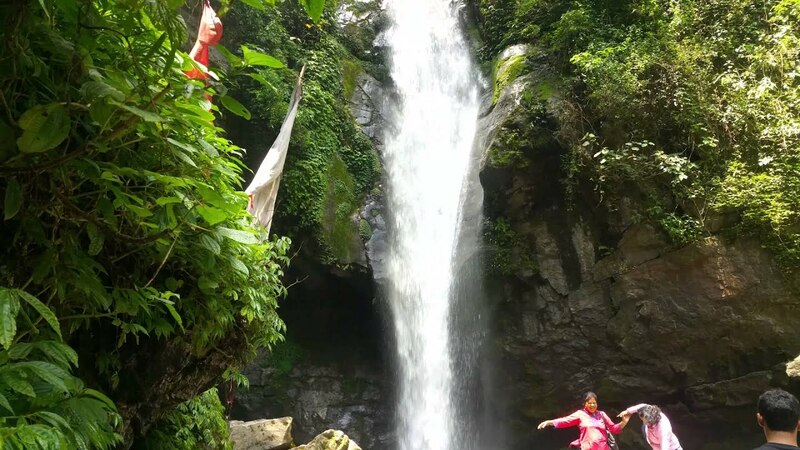 This magnificent waterfall is one of the famous places in Pelling. This waterfall amidst the snow-clad peaks of the Himalayas is an amazing thing to your eyes. You can go for a picnic or for clicking photographs as it the best photogenic place to capture and keep it with you. This place was the second capital of Sikkim but now it has turned into ruins. These ruins have become a major attraction. There is nothing much to see but the old building standing will make you know about the history of Sikkim. The mountain of Kanchendzonga gives spectacular scenery to the place with all its beauty. Singshore Bridge is the bridge of major tourist attraction. The bridge itself holds the beauty of the surroundings. It is a long bridge which connects two green mountains and no cars are allowed on the bridge. So, you can easily enjoy the whole bridge and the location by walking. Spending some time and exploring the jungles gives you the best experiences. Laying between Pelling and Gangtok it is the best tourist place in Pelling. The best time to visit the place is in the months from April to July. Hosts of exotic birds, forests of Rhododendrons and the adventure activities like rock climbing, trekking and the view of the mountains gives this place a major attraction for the tourists. You can visit this town and enjoy leisure time. Due to these beautiful places, Pelling is becoming a fully fledged tourist town. A visit to this town gives you the overview of the historic, culture and the natural environment. The outdoor activities and the fascinating trekking trails open a completely new door for the tourists.